Nothing is more beautiful and appealing than an Easter spread, complete with glazed ham, carrots, deviled eggs… followed up with a beautiful lemon meringue pie. Hmmm… Mornings of Hot Cross buns, egg souffles, chocolate bunnies and colorful jelly beans! Shall I go on?!? It is a wonderfully delicious time of the year, isn’t it? I’m sure you will be tempted, as am I, to share some of that bounty with your little fur-child. After all, they deserve to be included in the festivities as well, right? The problem is, so many of the things we eat at Easter time just are not good for your pet. Let’s break down into categories some of the things we eat at Easter: 1) Meats, Poultry, Seafood, 2) Vegetables and sides, 3) Breads, and 4) Treats! Now we’ll examine some of the most popular Easter foods and whether or not your dog can partake. A few years back, we started seeing “pork” in dog foods. I was raised to believe that pork of any kind is not good for a dog. Pork is high in salt and fat. That nasty combination could set your dog up for pancreatitis. Also, salt leads to excessive thirst. When your dog is thirsty and drinks too much water, it can be dangerous. It is said that the pork used in various dog food brands is “defatted”, making it a healthy source of protein for your dog. I’m still leery of it, though. If you wish to give your dog pork, stick to a reputable dog food brand and don’t hesitate to get in touch with them about their manufacturing process. That being said, a small bite of ham at Easter is not going to kill your dog, but it’s just not necessary. There are plenty other “treats” among the Easter feast that your dog can have, and it will be just as fun for him. Lamb, salmon, chicken is all good for your dog, but here’s the kicker – no spices. So if you plan on coating your meat or seafood with a savory rub or marinade, remove your dog’s portion before adding spice. Many spices are toxic and can cause pain, diarrhea, or an upset stomach for your poor dog. During preparation, cut off a piece of the meat and cook it separately for your dog – without butters, oils or seasonings of any kind. The meat of Cornish hens is not bad for your dog, but I would be concerned about the tiny bones. The bones could be a choking hazard. If you want to give your dog a taste of Cornish hens at Easter, make sure you remove the bones. Can Dogs Eat Deviled Eggs? What’s the most popular side dish at Easter? I don’t know if there has been a poll on this, but my guess would be deviled eggs! If your dog is not allergic to eggs, they are a great protein boost to his diet. When preparing deviled eggs, put aside a plain boiled egg before adding the mayonnaise, paprika, and whatever else you would normally add to your deviled egg recipe. Then cut up the boiled egg for your pup, and you enjoy the deviled version! Glazed carrots. All Easter bunnies eat carrots, right? Your dog can too! It’s perfectly safe to give your dog carrots, raw or cooked. Again, during preparation, set aside a few cut up pieces of raw carrots for your dog to enjoy. If they’re already cooked, just rinse any glaze or spicing off before sharing with Fido. I should note that some dogs have trouble digesting raw vegetables. Cooking will make them much easier on your dog’s stomach. Asparagus is an Easter favorite and you may find it soon to be one of your dog’s favorites too! Don’t tell him but it’s chock full of antioxidants and fiber. Asparagus can be eaten cooked or raw. You probably know that green beans are good for dogs. Many veterinarians recommend green beans to help your dog lose weight, or as a healthy alternative for treats. Feed them fresh and raw, or the “no salt added” canned variety. Recent warnings from the AKC inform pet owners that potatoes are not appropriate in a dog’s diet. Much of their warning stems from how potatoes are prepared, with added butter and salt. At Easter, the addition of milk/creams and cheese make it even worse. Plain, cooked potatoes are okay for your dog in limited quantities. Never feed your dog raw potatoes as they contain a compound that is toxic to them. Prepared Rice and pasta dishes generally contain some of the ingredients as do potatoes: oils, salt, milks, creams and cheese. So again we are reminded that plain, cooked rice and plain pasta is fine for your pet, unless he/she is allergic or sensitive to wheat and/or grains. Keep in mind that pasta and rice have very little nutritional value. It’s okay on occasion (like Easter?) but is not beneficial as a regular part of your pup’s diet. So, Aunt Edna brought her famous Jell-O fruit salad to dinner? Jell-O won’t hurt Fido, but the added sugar isn’t really good for him. And if it’s sugar free, the artificial sweeteners aren’t good for him either. A bite of sugar sweetened jell-o is okay, but make sure the salad does not contain grapes, raisins, currants or cherries. Breads are generally safe for your dog, as long as they don’t have any wheat allergies, but never feed them hot cross buns. This Good Friday staple generally contains currants and/or raisins which are toxic to your furry friend. If you’re home-making delicious rolls or breads this Easter, make sure your dog does not get into the dough as it rests and rises on your kitchen counter. Bread dough is very dangerous for your dog for two reasons: 1) The dough can continue to rise in your dog’s stomach. It can compress blood vessels and compromise normal blood flow. Not only that, but as it continues to grow (rise), it can cause a painful distension of the abdomen. 2) Your dog’s warm stomach causes fermentation of the alcohol in the dough, causing alcohol toxicosis. He would act as if he had a few alcoholic beverages, and it could be fatal. Now let’s get to the good stuff: TREATS! By now I think we all are aware that dogs cannot eat chocolate… so you’re just going to have to devour that chocolate bunny all by yourself! (Darn!) Aside from chocolate, what’s the most popular Easter candy? That’s right – jelly beans!!! Can dogs eat Jelly Beans? Well, I would be very careful with this one. There are sooo many kinds of jelly beans on the market and many, not all, contain ingredients that can be harmful to your dog. Sure, the sugar content alone is not healthy, but artificial sugars (particularly xylitol), artificial colors and flavors, and caffeine (why??? Beats me!) can be toxic to your dog. However, there are some jelly beans that aren’t so bad. Nearly all contain sugar of some type, but just make sure you are aware of all the other ingredients hiding inside that little sweet treat before sharing it with your pup. The same goes for candy corn and any other easter-shaped sweet. And of course, any sugary treat should be given in very small amounts to your pup. Peeps, those sugar-coated marshmallow confections… yummmm. Again, sugar is the villain, so why even think about it? Your dog won’t die from eating a Peep, but it could very well upset his tummy. With so many other healthy alternatives, why should we give our dog a Peep? Here’s something fun to do on Easter Eve, get the kids involved in making Peeps for dogs: http://www.gonetothesnowdogs.com/peepsfordogs/ There is a lot of honey in the recipe, so it’s best to limit your dog’s consumption. One more thing about Easter treats that may be sitting out in pretty baskets…. Plastic Easter basket grass is dangerous for your dog and cat. It can cause an intestinal obstruction or get wrapped around an organ. When you have pets in the house, we recommend you use paper grass. Lemon Meringue pie, carrot cake, banana cream pie, pineapple upside down cake… well, any kind of cake or pie (I just get a thrill listing them all!) is a no-no for your pup. The sugar and fat is just not good for them. You’re thinking, well, they’re not good for me either, but I eat them! I get that, but their digestive systems are smaller, more sensitive, and overall “different” than ours. Our system can tolerate many more things than theirs can. Sure, they eat garbage, poop, and weird things, but that doesn’t mean it settles well with them, and frankly, many times they end at the emergency vet. As responsible pet owners, we want to make sure our pets feel well and are healthy. We do that by offering them wholesome, nutritious food. 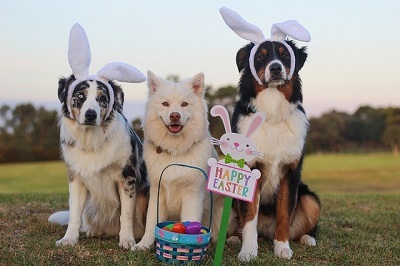 Is your dog staying at Holiday Barn Pet Resorts over the Easter holiday? We have some festive Easter foods to share with them! Our “Easter Brunch Furrmazing Feast” for our guests includes an egg and doggie-bacon biscuit and a special Easter take-home cookie! Or, indulge them with a Carob Bunny Bizzy Bone! A portion of the proceeds from the Furrmazing Feast and Bizzy Bone goes towards FETCH a Cure’s battle against Canine cancer this month! Error: Error validating access token: Session has expired on Monday, 29-Oct-18 09:08:51 PDT. The current time is Thursday, 18-Apr-19 19:26:41 PDT.